FORT KNOX, Ky. (Sept. 13, 2013) -- Sgt. 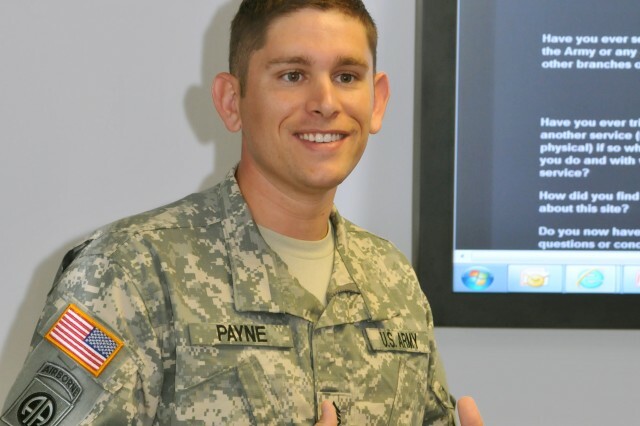 1st Class Steven Payne said he felt like a kid in a candy store -- to include jumping up and down -- when he and Staff Sgt. 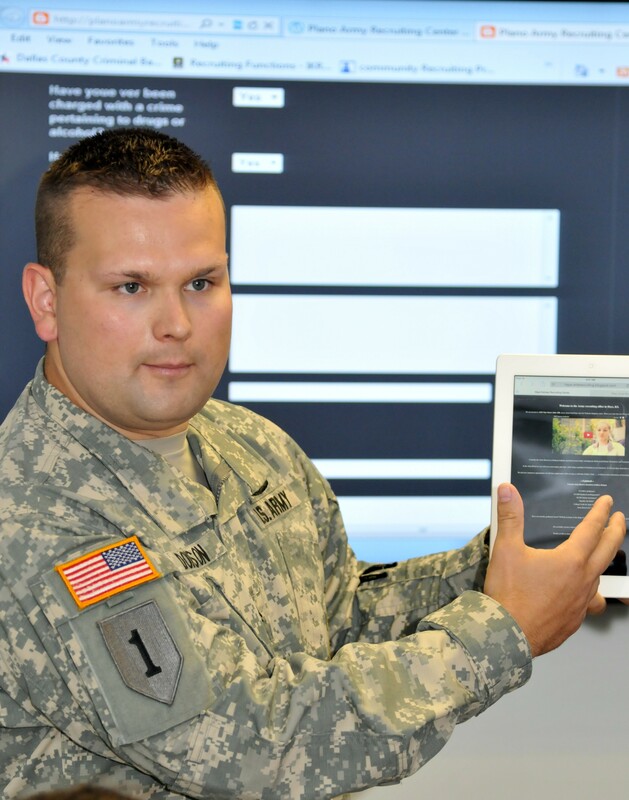 John Dodson got an invitation from the U.S. Army Recruiting Command, or USAREC, commanding general to come to Fort Knox and share their innovative recruiting tactics. Then, he said total shock set in that they would be briefing the entire USAREC staff. "Often the best ideas come from the bottom," said Maj. Gen. Allen Batschelet, USAREC commanding general. 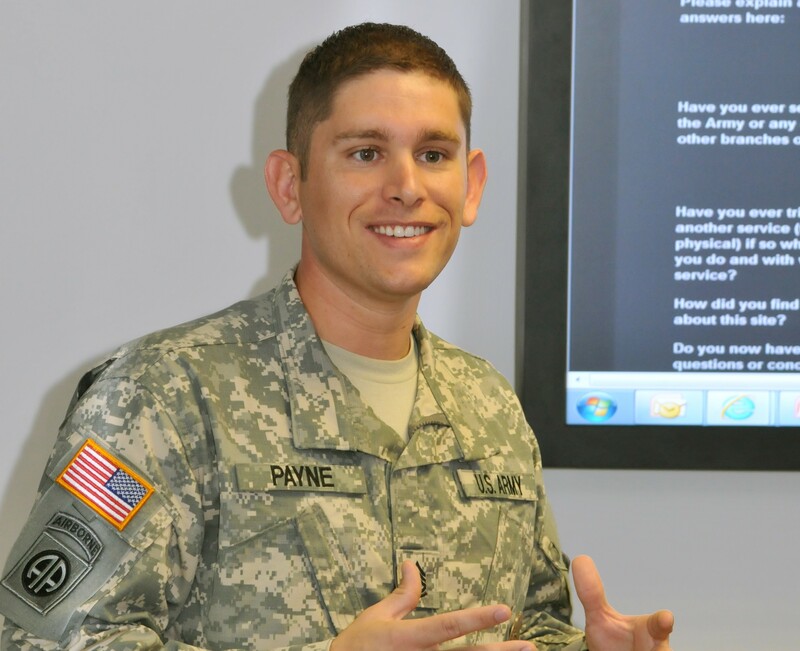 "We know these are not the only noncommissioned officers out there doing innovative things in the command, but [Payne and Dodson] came to my attention, so I wanted to get them here to have them show us what they are doing and acknowledge their innovation and contributions toward the success of this organization." Payne and Dodson spent Sept. 10 meeting with and briefing Recruiting Command directors and staff on how they are using free online and social networking tools to share best practices with fellow recruiters, engage potential applicants in more relevant ways, and more effectively communicate the Army Story in their markets. "From the moment we first arrived 'til the very end of the day, I felt like we were VIPs and not recruiters," said Dodson. "It was a great experience to have." Seeking new and innovative ways to enhance their recruiting efforts and connect with potential applicants, the self proclaimed "networking and technology geeks" began brainstorming and experimenting with different online and social networking tools when they were both assigned to the same recruiting company in Indiana. Dodson is now a recruiting center commander in Hays, Kan., and Payne is assistant center commander of the Plano, Texas, Recruiting Center. Both are carrying their initiatives -- and contagious enthusiasm for recruiting -- forward with their new teams. 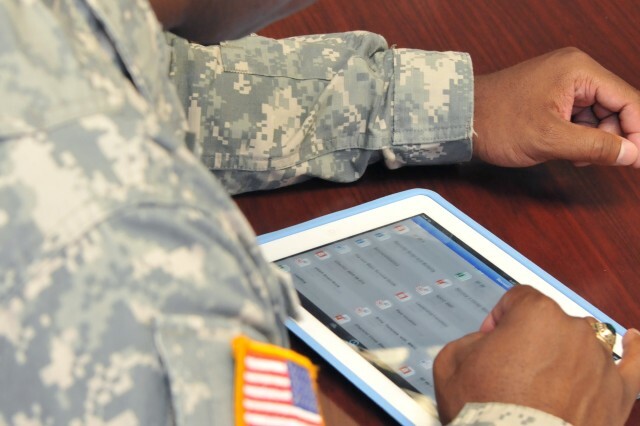 The non-commissioned officers established an Army Recruiting Forum on Facebook to network with fellow recruiters and staff, ask and answer questions, and share best practices. What started as a closed group with just the two of them and a few fellow recruiters has rapidly grown to more than 880 members. 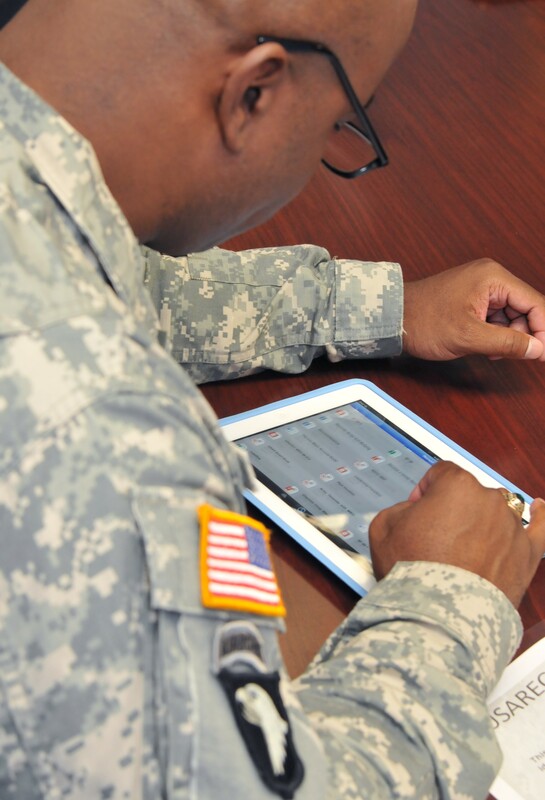 "It takes someone with a vision of how to use innovation that actually creates the future state we want to move to," said Mike Nelson, assistant chief of staff, G-2, whose directorate conducts market and mission analysis for the command. "Showing us how you are using these tools gives an appetite to try to move the entire command in that direction." Recruiting Command has to be able keep pace with what the target market is doing -- the rapidly changing technology they are embracing -- and the best people to help do that are recruiters with boots on the ground, said Ward Wood, assistant chief of staff G7/9 and the command's director of marketing, education and outreach. The staff sections will now determine the potential for leveraging their efforts across the command. Wood acknowledged there are hurdles to implementing some of their initiatives across the entire command, but they are hurdles his directorate wants to take on. "Oftentimes as a staff at the headquarters we lose sight of what you all are doing. Frankly everything we do at the headquarters is designed to enable you to do your jobs, so if we are not focused clearly on that then we've got our priorities in the wrong place," Batschelet said to the NCOs during an award ceremony at the end of the day when he presented them with Army Commendation Medals. "That is why it was important for me to have you come here and talk with us about your experiences." Batschelet also urged the recruiters to go back to their units and spread the word. "What makes us better is sharing those things that are working -- sharing with your fellow recruiters across boundaries," he said. "We want to hear from you all. We are committed to keeping an open mind to those of you out in the field doing the hard work. It's important to me that we get to hear what you all are doing and the experiences you are having so we can put the resources in place to make you more efficient and your jobs easier." After seeing how recruiting works from the top, Dodson said that if any first sergeants, recruiters or center commanders ever find themselves in the Fort Knox area, they owe it to themselves to stop in to the headquarters and see it. "It's a great way to see recruiting from an operational stance, and not just phone calls and appointments. It really opened my eyes to the way we do business." Payne said the visit made him "happy for the future." "Now my hope is that we can start implementing some of the tools we shared and use them the right way," he added. 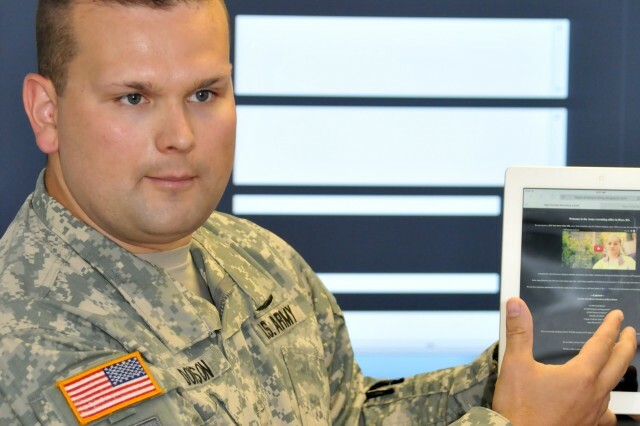 "This is not a perfect world, and the tools are not perfect, but with the help of USAREC staff, we as a team can make them highly useful for the entire force."